Before you were fighting zombies; now you have to work with and against the other human Survivors, Militia, and Gangers. Now you must learn how to survive and thrive in this dangerous and ever-changing world. -A full set of color counters including Survivors, Gangers, and Militia characters, as well as a wide range of weapons and loot that you can find during your games. 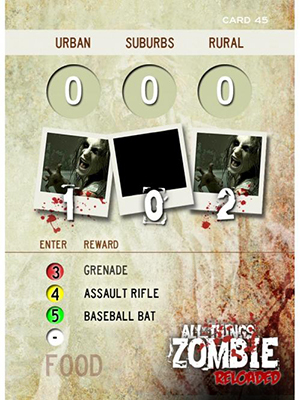 -A set of Event Cards that provide all the info you need at a glance, from friends, enemies, zombies, loot and more. -Newly designed Player Aid cards to help you keep track of your characters and their “stuff”. --An easy to use campaign system that ties all your games together where the results of one affect the results of the next. -Six 11” x 17” maps that can be laid out in over 50 different ways, making each game unique. -Specific objectives that provide ways for your characters to increase in skill and ability when they succeed.